Intended for heavy-duty use and perfect if you're working in a musty, moldy area, brushing your pet, sanding or cleaning house. Mask is reusable and is generally good for about 150 hours. 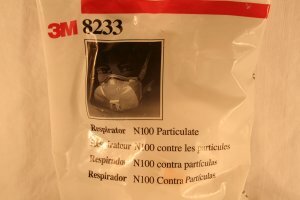 The 3M 8233 N100* Particulate Respirator is well suited for those who want NIOSH’s highest rated filtration efficiency in a maintenance free respirator, capturing 97% of particles at .3 microns. This mask is also effective at reducing your risk of contracting airborne viruses like the flu and SARS. The patented 3M Cool Flow Exhalation Valve offers easy exhalation and cool, dry comfort. Comfortable to wear, the mask contours easily with it's adjustable noseclip to help provide a good, secure face seal. Lightweight construction also increases comfort and contributes to increased wear time. This latex-free mask is considered medium size and will fit most faces. *N100 is NIOSH's highest particulate filtration rating, encompassing and exceeding N95. Why consider having filter masks on hand? If circumstances require you be outside during dangerous emergency conditions, a filter mask protects you from inhaling airborne substances into your lungs. Again, you must determine your needs before you select from the wide range of available types of mask. If the emergency that faces you is one that relates to known inhalant threats--such as smoke from wildfires—you can plan accordingly. The simplest and most familiar form of wearable filtration is the single-use disposable dust mask of the type worn by industrial workers (painters, potters, etc.) who wear them to avoid inhalation of tiny airborne particulates. Generally, this type of mask works passively; powered by the wearer's own breath, inhalation causes foreign particulates to become embedded in the filter’s fiber network, which may or may not include carbon granules embedded in interlocking netting. This type of mask is designed to be inexpensive and disposable, and there is not an airtight seal between it and your face. It is not designed for a smoke-filled environment, or to filter out toxic gases or particulates. If, as mentioned at the beginning of this article, your main concern is surviving a retreat through wildfire smoke, the smoke mask should be added to your disaster emergency list. This pillow-like mask uses moist-filter technology, natural plant extracts, and negatively charged polystyrene beads to capture smoke, dust, airborne fiber, and other particulate matter as small as 0.300 microns. It also filters dangerous gases commonly found in the air near a fire such as carbon monoxide, acrolein, hydrogen cyanide, nitrogen dioxide, and nitrogen monoxide. (Smoke mask filtration test results coming soon!) A smoke hood and goggles are also available. A gas mask is required to absorb many VOCs*, chemical and biological warfare agents, and radioactive particulates. These masks have an airtight seal that conforms to your face, and have specific filtration cartridges, uniquely designed to capture and contain certain contaminates. The cartridges must be replaced before they become saturated with toxins—usage time must be recorded and the cartridges replaced according to the manufacturer’s schedule. Protective body wraps are also available, and work in conjugation with certain airtight systems. If you have children under the age of eight, their lungs may not be powerful enough to cope with the resistance of a passive filter, and they must have specialized blower units. Chemical, biological, and nuclear full-body protective wraps and gas masks are also available in children's sizes. * Volatile organic compounds (VOCs) are emitted as gases from certain solids or liquids, such as gasoline, kerosene, or paint solvents.